Are you thinking of hiring a contractor for your home office remodeling project? With the right planning and an experienced remodeling company, you can be assured of a job well done. Remember, a home office remodeling project can be a pleasant experience; as such, select a contractor you feel most comfortable working with during the process. If you have interviewed several home office remodeling contractors and have multiple estimates, you have a big decision to make. Our advice: choose the remodeling company that understands your home office needs, can address your concerns, be a trusted advisor, and will work with you collaboratively, side-by-side. At Republic West Remodeling, we always make it a priority to respect your time, your opinion, and your budget. If you want background information about whether a particular contractor is a good fit for your home office remodeling project, make it a point to reach out to previous clients, asking about the company’s work ethic, quality, and reliability. Republic West Remodeling’s team of professionals provides a caring and respectful experience to our clients. Many states require remodeling companies to be licensed, bonded, and insured. Check with your area-licensing agency to confirm that the contractor you want to hire meets these requirements. Also, be compliant. 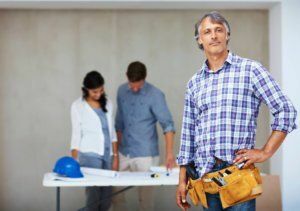 When it comes to permitting requirements and local building codes, hiring a local professional who works in the community can help. Keep in mind: requirements often vary in each jurisdiction. At Republic West Remodeling, our knowledgeable team members use an extensive planning process, factoring in these requirements, before execution. Then, one of our architects with vast remodeling experience takes the handoff from the sales/design team and plans out every detail in preparation for your home office remodeling project. At Republic West Remodeling, our team is proud of the more than 17,000 Phoenix home remodeling projects we have completed since 1995. From home office, kitchen and bath remodeling, whole house remodels, room additions, and outdoor living spaces, our projects add sophistication, style, value, and function to your home.